Nils Testor, an early 20th century immigrant from Sweden, is a classic American success story. 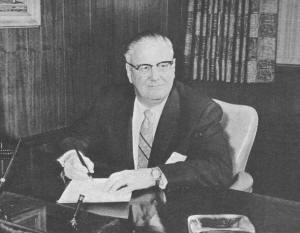 Having begun his management career at Woolworth as a stock boy (although he had a college degree from Stockholm), his business acumen and love of the arts - including airplane modeling - quickly propelled him into the position of entrepreneur as owner and progenitor of the Testor Chemical Company. Beginning with selling household glue, he soon added nitrate and butyrate dope, balsa, airplane kits, paint-by-number sets, and model engines. He leveraged the Great Depression and World War II eras to great advantage, although Testor's business and personal life suffered its share of downturns and tragedies. "Learn, learn and keep on learning. Learn with your head but also with your hands." Here is the 2-page Testors ad that ran in that same issue of American Modeler. When Nils F. Testor, who owns a number of enterprises prominently identified with the craft, model and hobby industry, had completed his education at the Frans Schartua School of Business in Stockholm, Sweden, he wanted to spend a year aboard. He had Berlin, Paris, or London in mind, so he could gain practical experience in business and thoroughly learn a foreign language. Nils F. Testor at his desk in the Rockford, Illinois, office. His home is now at San Juan; Puerto Rico. The year was 1924. Nils was 21. His mother suggested he should go to Aurora, Illinois, in America, where he· had an aunt, who might keep a watchful eye on him. He arrived in Aurora that August. He had neither a craft nor trade and the young Swedish immigrant found it difficult to get a job. His money dwindled for two months. Late in October, he answered a blind advertisement in The Chicago Tribune. The F. W. Woolworth Company was looking for applicants to qualify as "learners." This looked good to the Swedish lad, who was out to gain business experience, even though it meant a 3-year learning period. It was a challenge as he moved from stock handling to window trimming, counter displays, office detail, purchasing, and into a correspondence course and seminars for the theory of sales and management. Nils was put in overalls as stock boy in Woolworth's State Street store in Chicago. He spent his first Christmas eve and Christmas day working, quite in contrast with the celebrating and gaiety which he knew was going on in his home back in Stockholm. "You'll be back before Christmas!" members of his family and friends had predicted when he left his comfortable Stockholm home. Making good, young Testor was sent as manager on January 1928, to a Woolworth store in Rockford, Illinois. In three years, he had "graduated." He had achieved a good position and security, also a good salary. And he had gained what he wanted most - invaluable business training. In the meantime, he had married Elizabeth Forss, of Aurora; a son was born their first year in Rockford. Testor had changed his mind about staying abroad only a year because he felt the Woolworth 3-year training was important to his future. As store manager he began to realize that from then on he would have to be content with only two weeks of vacation a year and that he could not expect to visit his family and friends in Sweden. (This was not yet the jet age and passenger ships took 11 days to travel from New York to Gothenburg. Testor had become acquainted with Axel Karlson, a Swedish manufacturer of an adhesive famous in Sweden, known as Karlson's Klister. Karlson had formed a small company in Rockford with a number of investors; he persuaded Testor to take the job of office manager in the new firm. Prospects seemed good and Nils visioned the possibility of taking time off for an occasional trip to Stockholm in the new position, even though the beginning salary was not half what the Woolworth job paid. One of the major manufacturers in the paint-by-number business, Testors has contributed new marketing methods and packaging systems. Concern now makes model engines, gliders, plane kits, finishes and adhesives of all types. Karlson's Klister was used as a household cement, to stop runs in women's stockings and to cement soles of shoes in repair shops. The depression hit the company and financial reverses doomed it. The firm was liquidated in 1934. Testor, seeing possibilities in the product he had nurtured through the lean years, borrowed funds from a friend and purchased the assets of the firm. He continued the business as sole stockholder and proprietor, which has been his method of doing business ever since. The name was changed to the Testor Chemical Company. The product was sold as Testor's Household Cement. Through the years, it has continued a popular item. Soon Nils expanded his line to include adhesives for the craft, model and hobby industry. This was Testor's entrance into a field where he has attained a dominant position. By 1940 the Testor Company had grown so new quarters were required. A complete factory building was occupied and here a laboratory was established and research begun in finishing materials for the craft, model and hobby industry. Thus was born the complete line of Testor's nitrate and butyrate dope. World War II broke out and chemicals were unobtainable except for defense purposes. Testor entered this field to make and ship over 1,000,000 gallons of finishing materials to the military forces. Simultaneously, Testor found he could obtain Mexican pine, and with it he began making scale model airplanes, which were sold in attractive kits. Second-hand woodworking machinery was purchased and the Testor firm was in the business of making accurate scale models of such famous airplanes as the B-17, B-29, C-54 and later the DC-4 and Constellation transport planes. These were sold in large volume until the war's end. Another factory had been acquired, for woodworking, but on Feb. 1, 1944, Testor had the awful experience of seeing this factory destroyed by fire. Loss was estimated at $220,000. As he inspected the smoldering ruins, Testor told The Rockford Morning Star: "Of course, we are discouraged, but I've suffered setbacks as well as encouragement in the 15 years I've been in business. We are fortunate in having men and women who are willing to dig in and create something better out of the ashes. It does no good to feel badly about what happened. We'll just start to build again and benefit from our past experience." The plant was rebuilt and production got under way again. Testor credits the "wonderful team work" of his organization and the role played by top management and others for whatever success has been achieved. A number of key people have been with the Testor firm for 15 to 25 years. Testor expanded his line of products by adding model airplane fuel, new adhesives, plastic cements and enamels in 48 colors. To handle this volume, a second modern factory was built and occupied January 1, 1951. 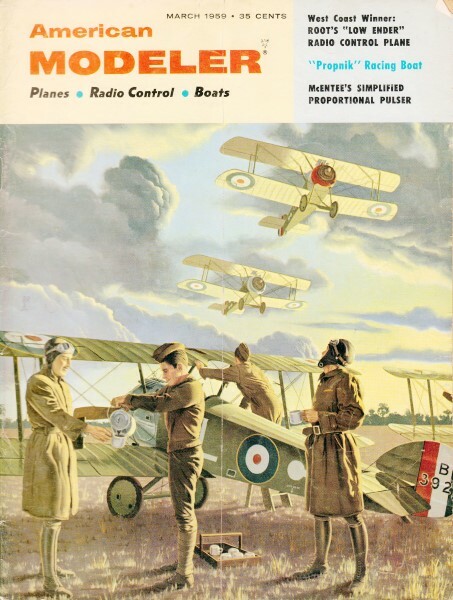 The scale model wood kits were discontinued and Tester began making balsa toy airplanes. He used a new approach in merchandising and packaging. Mass produced, the Go-High glider at 10 cents was an instant sales success. So were a 25-cent glider, 29-cent catapult glider and 49-cent rubber-powered airplane with plastic propellers and landing gear. They sold by the million and are still made in substantial volume. The Balsa Processing Company was acquired by Testor in 1954. This made Testor a producer of balsa sheets, strips and dimension stock for the hobby industry and, one of the largest users of balsa in the country. In 1955, Testor negotiated for purchase of the stock of the Duro-Matic Products Company of Culver City, California, a company which since 1941 had been making the famed McCoy model engine. The acquisition was to broaden the line of Testor products. Thus he added a metal working plant to his woodworking and chemical factories. The Duro-Matic Company also manufactures precision parts as a sub-contractor to the full scale airplane industry of California. Production of the McCoy engines has expanded greatly - the newest Testor model plane kits, sold under the name of "Freshman," are powered by the McCoy engines. A new smaller McCoy engine has been developed and was presented at the Hobby Industry Association trade show in Chicago this February. It is the McCoy "5" selling at $3.95. Thus, the range of McCoy engines for the model field now is from its big "60" to the small "5." 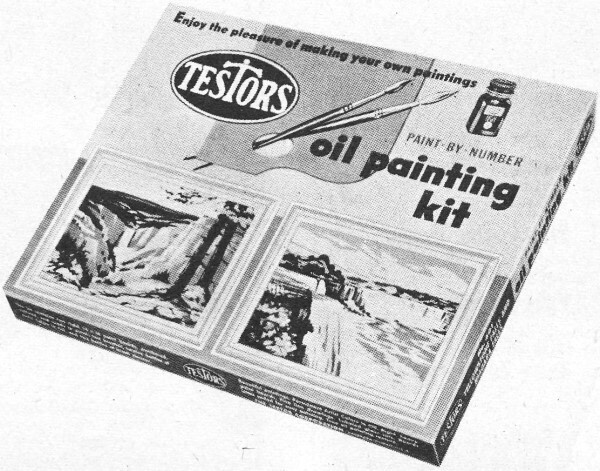 After several years of research, the Testor Company in 1956 began manufacturing paint-by-number kits. Of outstanding quality, both for its artists' colors in oil, developed and made by Testor, and its packaging, they met with instant success. The packaging won a top trade award in 1958. New facilities again were needed. The two Rockford plants had become too small. Puerto Rico attracted Nils F. Testor's imagination and interest. A new plant was acquired in 1956 between Catano and Bayamon, close to San Juan harbor. The Testor Balsa Company, Tnc., was formed. A year later the Testor Adhesive Company, Inc., was formed and a second plant erected nearby. The woodworking operations have moved from Rockford to the balsa plant in Puerto Rico and the making and packaging of all Testor tubed adhesives have been moved to the second plant. This leaves the manufacturing and packaging of the bottled Testor finishing materials and the assembly and shipping of the paint-by-number kits in the two Testor Rockford plants. Testor produces 30,000,000 tubes of cement and adhesives a year; the bottle products sell in even higher volume. A fifth bottling line has been added at the Rockford plant and the space formerly used for producing the balsa products is devoted to packaging and shipping the paint-by-number kits. Testor has acquired an ocean-front home at San Juan and has moved there with his family. He also has acquired an office in San Juan but is not making any changes in his Rockford office, where he spends some time each year. A Swedish corporation was organized several years ago by Testor; it has the name of Testor Produkter AB. Headquarters are in Stockholm. A warehouse is located nearby. Testor has found time to make frequent trips to Sweden and other countries. Mr. Testor's first wife died in 1944 after an extended illness. He married Elaine Meshkoff in 1945. They have three children: Kristina, 12; Mamie, 11; and Fredrik, 4. Testor's one absorbing hobby is music. He has a tremendous record library of world-famous operas. Always from childhood, he has been interested in music and the fine arts. As a boy he would attend the Royal Opera performances just as American boys attend the movies - perhaps oftener. Testor has been a patron of Rockford and Chicago choruses and music groups. He toured Sweden in 1953 with the Chicago Swedish Glee club. Nils is a director of the Swedish Historical Society of Rockford and its museum; he helped entertain Prince Bertil of Sweden both in 1938 and 1948 on Rockford visits. He has been a director and secretary of the Swedish-American Hospital in Rockford since 1940. He felt there was need for a first-rate mixed chorus in Rockford and two years ago organized the Testor Chorus, which in its concert last June had 70 voices and was acclaimed as outstanding. It is directed by Dr. Harry T. Carlson of Chicago. In recognition of his cultural and business contributions, Mr. Testor received the Swedish decoration of Knight of the Royal Order of Vasa from the late King Gustaf V of Sweden in 1950. He also received the Swedish Pioneer Centennial medal from Prince Bertil in 1948 and the Royal decoration of the KFUM (YMCA) Chorus of Stockholm in 1956. Testor loves the water and sea and it is one reason he has moved to Puerto Rico with a house on the ocean front of San Juan. He enjoys flowers and trees and has many around his factories. At his Rockford home, he spent as much as $3,000 on surgery to save a single oak tree. Such is the story of a Stockholm youth who when he first looked at the New York skyscrapers in 1924 scarcely dreamed that one day products bearing his name would be sold by the millions in the canyons that are New York streets, or that his name would identify products sold everywhere in the world . Testor has faith in the craft, model and hobby industry. He has faith in youth. He feels that the model and hobby interests can do much to whet the appetite of teenagers for the jet and atomic age into which they have been catapulted. The little model engines are the key to learning the secrets of combustion and .propulsion. "Give youth every opportunity to work with actual models," Tester urges. To young people, his advice is: "Get a good education. Learn, learn and keep on learning. Learn with your head but also with your hands."